To download the hi-res version of this, click here. To download the full-res version of this infographic, click here. Designed the second infographic in a series detailing the symptoms, risks and treatment options for various types of cancer. To view the first for esophageal cancer, click here. These may be distributed freely with credit. If you have any of these symptoms, please consult your doctor immediately. To view/download the full-res version, click here. 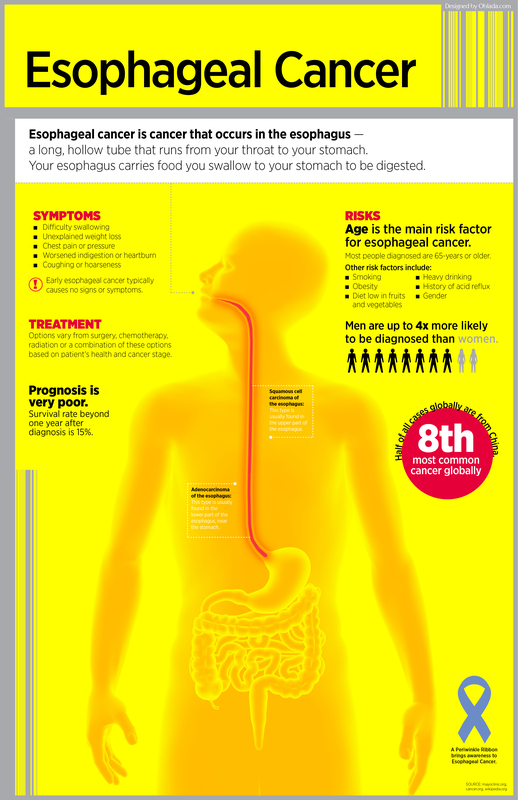 This is an infographic I designed providing more information on esophageal cancer. It may be distributed freely with credit. If you have any of these symptoms, please consult your doctor immediately. Download the full-size version here.